This book is so much better than I expected! 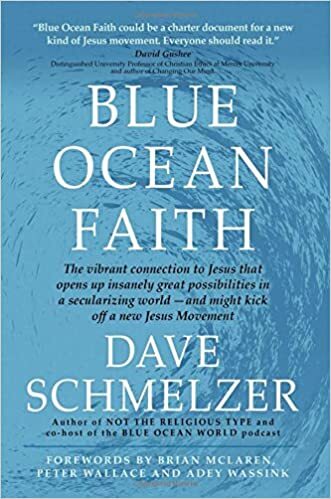 It's not that I had very low expectations for this work by Dave Schmelzer, but I already listen to his weekly podcast of the same name, I already get his newsletter, I have read many of the articles on the Blue Ocean Faith website, and I did not know if there was anything new for him to say. I'm not sure if he has said anything new, but he presents it very well with great anecdotes and illustrations from his life and those of his fellow BOF co-laborers. Yes, I was a fan before the book and I'm a bigger fan since reading it. He is not ashamed of his theological roots but triesnot elevate his preferences over the bigger picture. What does he see as the bigger picture? The important "sola" is solus Jesus which is over and above sola scriptura. Not that scripture is important but scripture is read through the lens of Jesus. The focus is on Jesus not ring fencing, defining who is in or out, he calls this "centered set". See my post on this as he started preaching on it back in 2012. Spiritual growth comes through childlike faith. There is a middle way for controversial theological topics, see Romans 14. Because of this third way, churches can connect despite their differences, AKA ecumenism. Finally, the church can joyfully engage with the culture it swims in, see St. Francis for an example. You'll have to go the BOF site to get these slightly filled out or buy this book to get them really filled out. I also benefited from his distinctions of biblical beliefs. This leads into a discussion of the third way of religious doctrines, following Paul's lead in Romans 14. He applies it to today's hot controversy over LGBTQ inclusion. A church focused on Jesus and not on it's borders encourages all to follow the Jesus way, no matter their orientation, and allows all to use their God given abilities (spiritual gifts) at any level of service they are capable and desirous. This is beautiful and lonely. In a church culture focused on borders, a church movement that does not share that focus will be considered outside the fence. However, BOF people seem just fine with bringing the joyous good news of Jesus to everyone outside the fence. They are not the first ones there. May they be ever more successful in lifting Jesus up for all to see. I received this book for free in exchange for my honest review from Speakeasy.